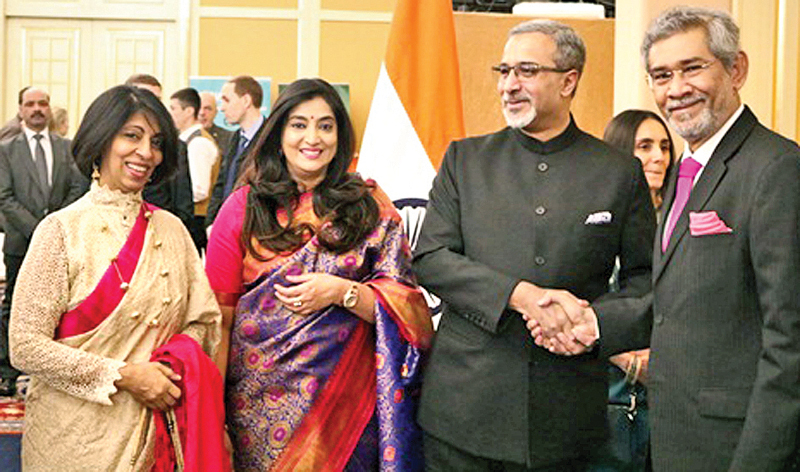 Ambassador Dayan Jayatilleka and his wife Sanja Jayatilleka attended the reception dedicated to the 70th anniversary of the Indian Republic Day, at the invitation of Indian Ambassador D. Bala Venkatesh Varma and his spouse Madame Vidya Datla Varma on January 25 in Moscow. The Indian Constitution came into force on January 26 in 1950. The reception was attended by representatives of the Russian Foreign Affairs and State Authorities Ministry, Ambassadors and Defence Attaches of foreign countries. Director of the Second Department of Asia, the Russian Foreign Affairs Ministry Zamir Kabulov and President Putin’s special representative for Afghanistan addressed the audience. In his speech, Director Kabulov underlined the importance of longstanding bilateral relations between the countries.